Chapter 8 takes a literal and metaphorical detour (or at the very least, a pitstop) to flashback to the star-crossed lovers' first meeting. It's... not as romantic as it sounds. Marko was a POW at the prison where Alana was stationed for guard duty. She'd just finished reading A Night Time Smoke, a book that would change the course of her life. She lauds it copiously to McHenry, another Landfall soldier on hand— who later becomes Prince Robot IV's 'right hand' on Cleave. McHenry is unimpressed. Anyway! Marko doesn't make the best first impression, but as meet-cutes go, I've seen worse. (Hazel totally reads TVTropes.) The point is we get to see them before they knew each other, before they became the folks we meet in issue 1. It's a stark contrast, and it makes for good storytelling. Woooo storytelling! Back on the ship, Barr is laying Hazel down in her crib while Alana briefly wakes up from the sleep spell he cast on her in chapter 7. Barr gets to show his character, here. He's gentle, fatherly, and doesn't bat an eye or sneak a look at helping the naked, defenseless Alana back to bed. He's one of the good guys. Then we're back on the planetoid where Klara banished the ghostly babysitter, Izabel. Klara and Marko's search was interrupted by Fard: the naked, filthy, probably-STD-riddled colossus. With Klara's help, Marko casts a binding spell to bring the giant tumbling down. She's so efficient, she can even make time for more disparaging remarks about her only child. It's not long before Marko puts his foot down, in the most awesome way possible, summoning lightning to strike a few inches from mother dearest's foot. "That is the last time you ever say a cruel word about the mother of my child." He hasn't forgotten whom he's talking to, though. "Please." Alana finally wakes up proper, to find her sleeping baby on her chest, and a surprise package at the foot of her bed: Clothes. Seems Barr knows his way around a spinning wheel, and has made a number of clothes that will protect his loved ones from blaster shots and the like. Barr's pressed for time— he's still dying— and he wants to do everything he can for Marko's family with the time he has left. Great clothes aside, Barr and Alana bond over their mutual love of Marko. It's incredibly sweet, and my words here don't do the simple, elegant scene justice. Planetside, Marko wakes Fard, who has ominous words of warning: The planet isn't a planet, it's an egg. One that's ready to hatch. If this bombshell wasn't enough, we close on a brief visit to the shoreline offices of Erving, The Will's agent... and anthropomorphic seahorse. (I love this comic.) Erving's busy putting out fires when he's surprised by Gwendolyn. Marko's ex-fiancé. While chapter 8 isn't heavy on action, it's still a grand read, and well worth your time. 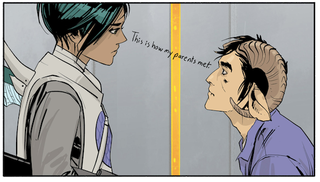 Brian K Vaughan and Fiona Staples work is consistently great, and this chapter's no exception. Go buy it, and check back in soon for a recap of chapter 9! Casey Jones is a writer and VO artist. You can see and hear his work at www.caseyjonescaseyjones.com.